The majority of Americans have no idea what the Keystone XL pipeline is, but among those who do, support for its construction is firmly split along partisan lines, according to a new poll released Wednesday. The University of Texas at Austin's Energy Poll surveyed more than 2,000 adults, and found that less than half -- 42 percent -- were familiar with the proposed Keystone XL pipeline. The pipeline, which would carry oil from Canada's oil sands to refineries in Texas, has proved controversial in Washington. Congressional Republicans have tried repeatedly to force approval of the pipeline through legislation, but the Obama administration has so far held off on issuing a final decision on whether to grant a permit for the pipeline. Most recently, both the House and Senate passed legislation that would approve the pipeline, and President Barack Obama promptly vetoed it. 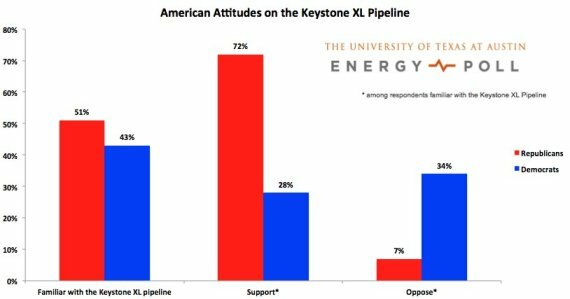 Of the self-identified Republican respondents who said they are familiar with Keystone, 72 percent said they support it. Only 28 percent of Democrats who know about the project said they support it. Sheril Kirshenbaum, director of UT's Energy Poll, said the results track similarly to how they do for other energy issues. "We’re seeing a continuing divergence of views on key energy issues that clearly tracks political party lines," said Kirshenbaum. The poll also found sharp partisan divides on hydraulic fracturing and climate change. Respondents' reasons for opposing the pipeline varied. Seven percent of Democrats who oppose it said climate change is their main concern; 36 percent cited environmental degradation more broadly. Twenty-six percent of supporters of the pipeline citied energy independence as the top reason they support it, followed by 25 percent who cited job creation and energy prices. The poll used an online panel to survey 2,078 Americans between March 4 and March 13.